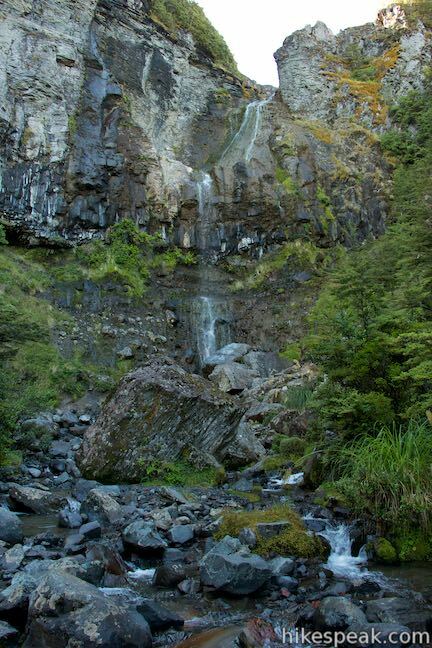 It’s pretty obvious that Waitonga Falls Track goes to a waterfall, which is actually the tallest waterfall in Tongariro National Park. 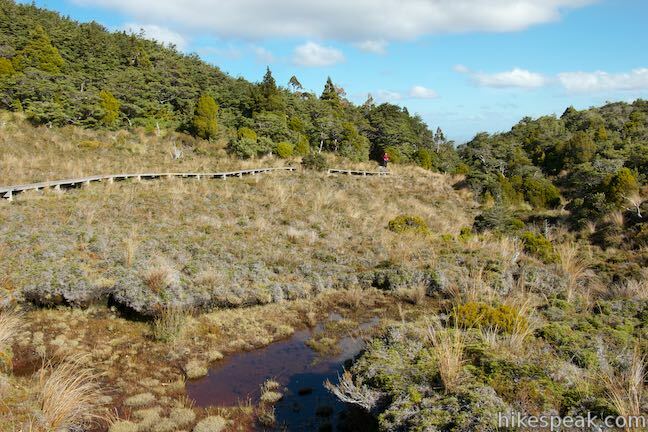 The track’s other offerings may surprise you though, like a boardwalk across alpine wetlands with pools that hold a mirror to Mount Ruapehu, the biggest volcano in New Zealand. 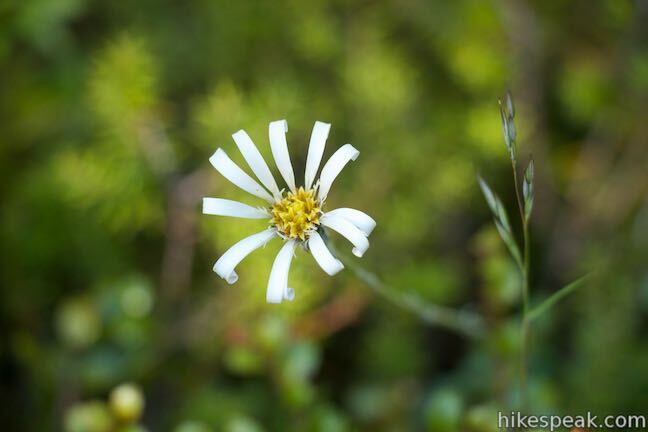 Indeed, you’ll get big enjoyment from this 4-kilometer (2.5-mile) round trip trek with 110 meters (360 feet) of elevation change. 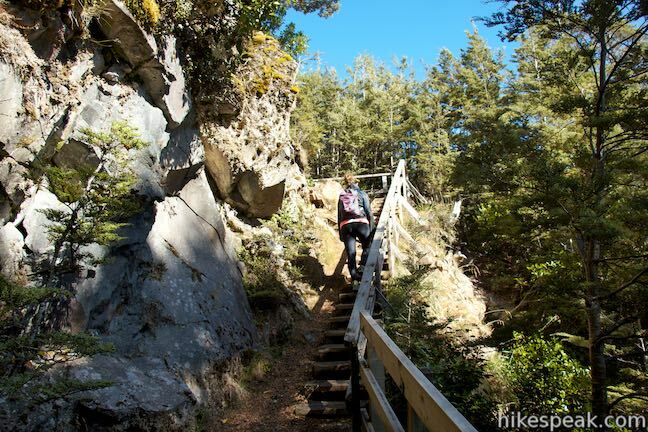 The hike to Walktonga Falls begins from Ohakune Mountain Road. 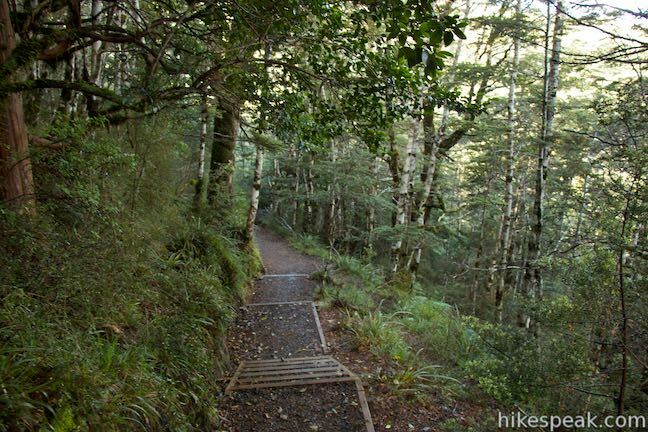 There is a sign listing Waitonga Falls Walk as a 1 hour and 20 minute return. 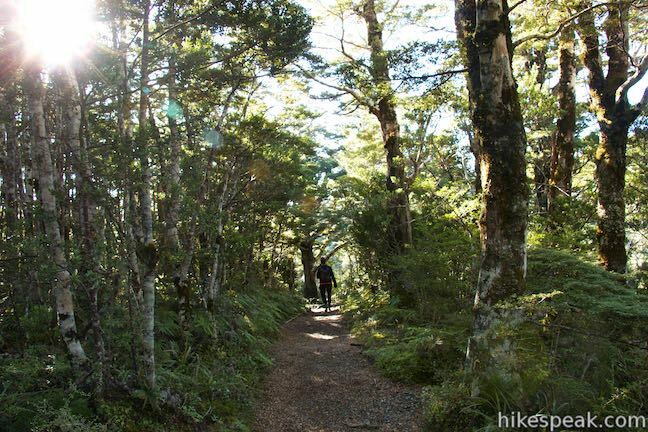 For those trekking past Walktonga Falls, the sign lists the distance to Blyth Hut as 1 hour and 30 minutes and to Mangaehuehu Hut as 3 hours. 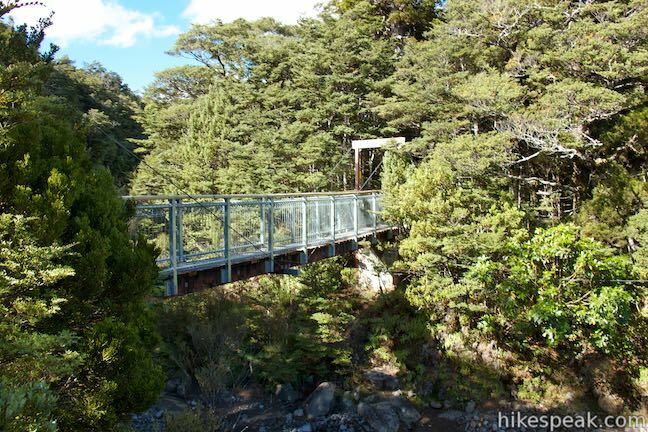 Waitonga Falls Track leaves the road and drops toward the Mangawhero River where, just 70 meters from the start, you’ll cross a swinging bridge spanning the small river’s rocky canyon. 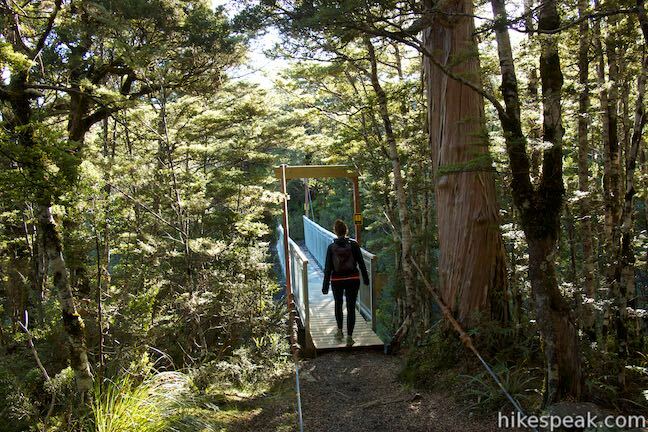 Across the bridge, the track ascends through a forest of cedars and beech trees. 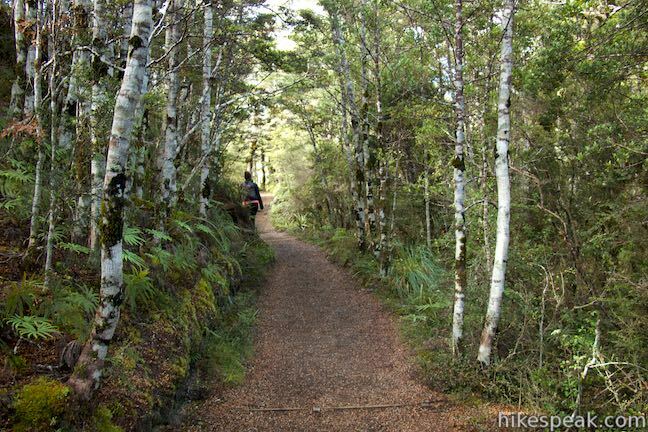 Patches of ferns and moss line this pleasant woodland path. 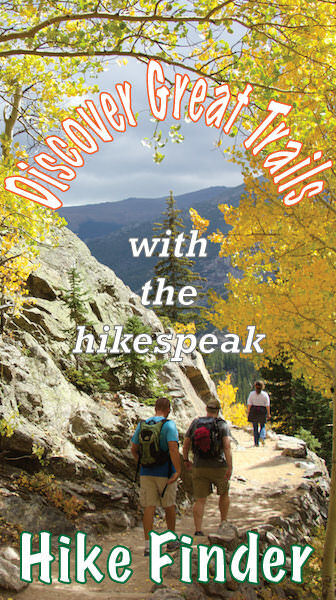 After 0.6 kilometers of hiking, go up a staircase built into the track that goes up and around a rock outcropping. 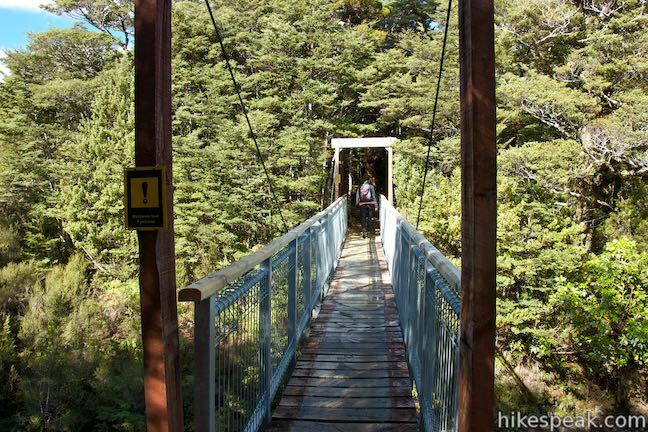 The undulating track heads downhill for a stretch, crosses a footbridge, and aims uphill again. Pass one of the benches along the track and come to the only junction on the way to the falls. 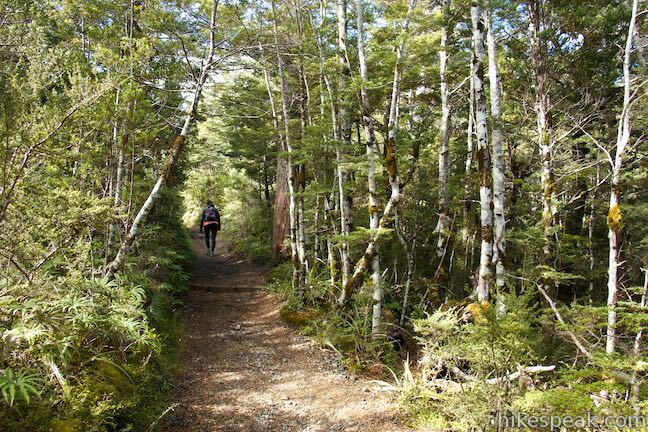 At 0.9 kilometers from the start, Old Blyth Track breaks off to the right and heads down the mountainside toward another trailhead along Ohakune Mountain Road. 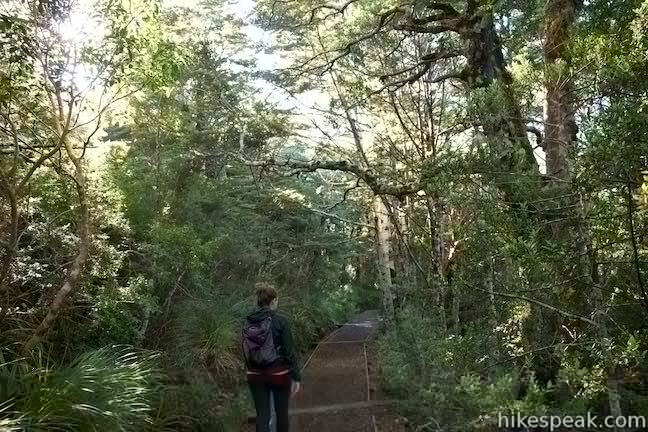 Continue straight through the junction toward Walktonga Falls, which the sign lists as 20 minutes away. 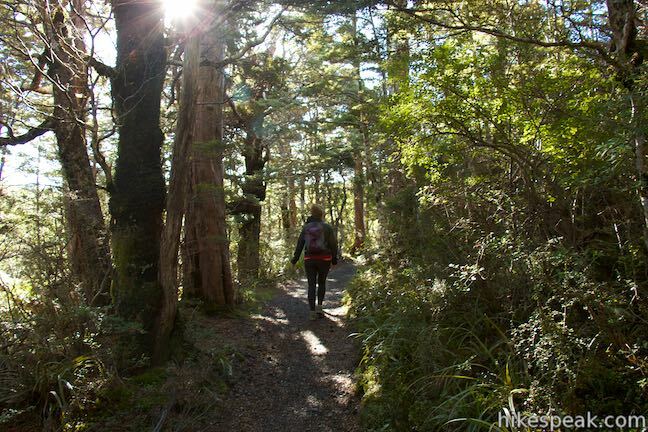 Past the junction, the track heads downhill and crosses a gully. 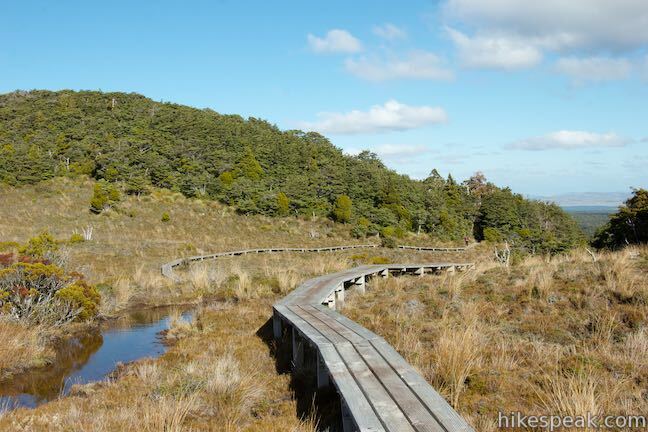 Ascending again, the track exits the forest and levels out, entering a grassy alpine bog filled with small pools. 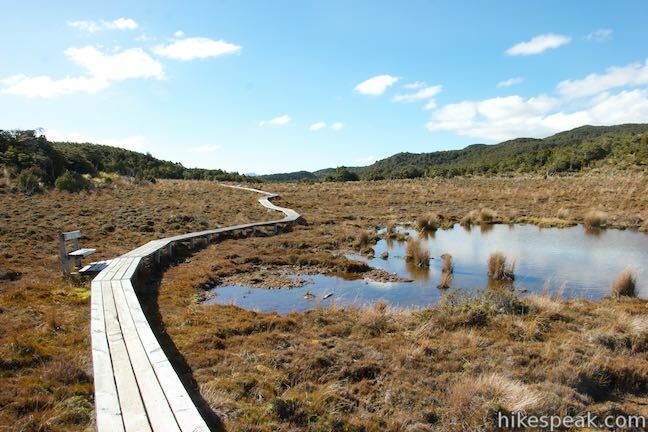 A boardwalk crosses this fragile, scenic area called the Rotokawa Pools. 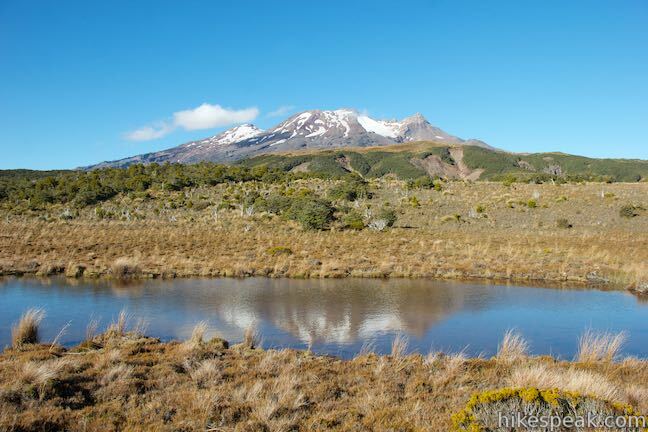 when conditions are clear, you’ll see Mount Ruapehu towering to the north. 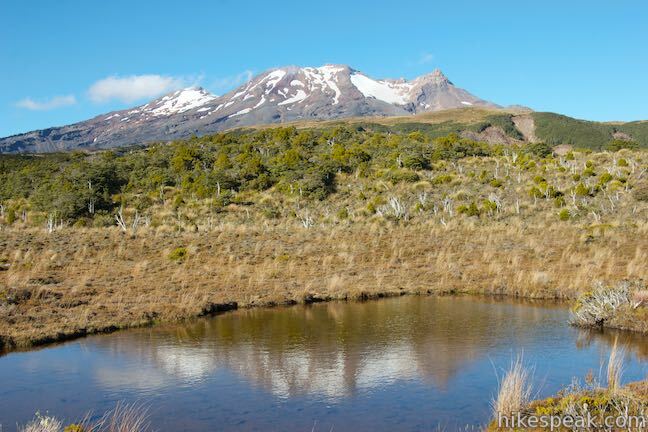 The accommodating boardwalk passes along the south side of the pools, setting you up to enjoy reflections of the massive volcano. 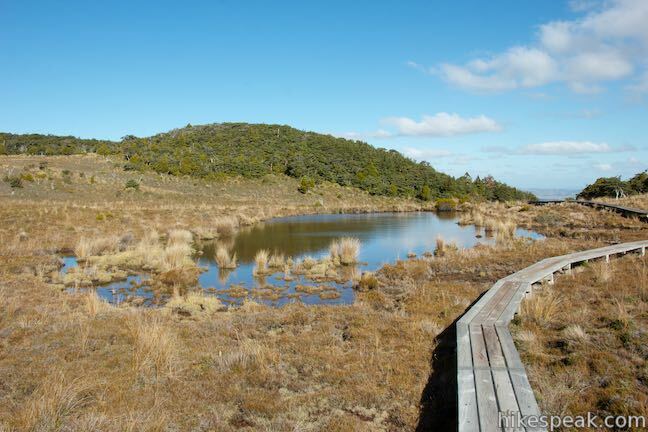 At the middle of these alpine wetlands, about 1.2 kilometers from the start, a bench next to a pool provides a place to pause and take in the view. 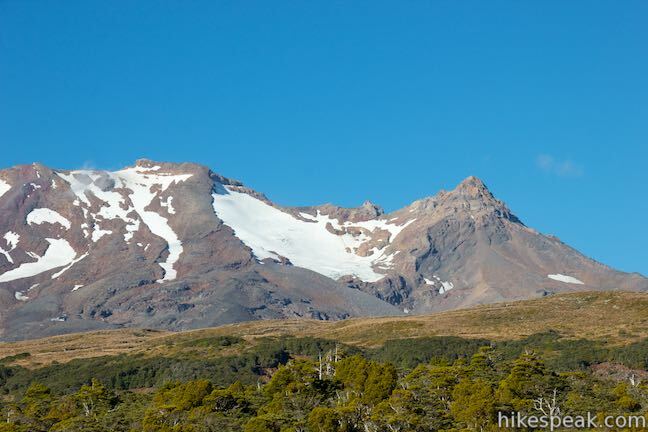 Mount Ruapehu is the highest peak on New Zealand’s North Island with steep ridges and snow-covered slopes. 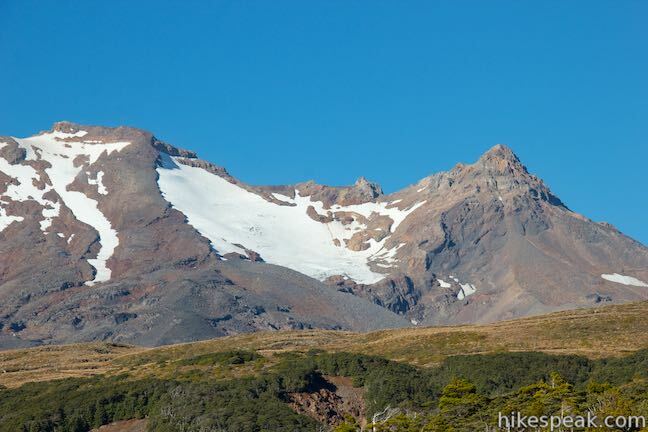 The volcano looks impressive right side up and upside down. 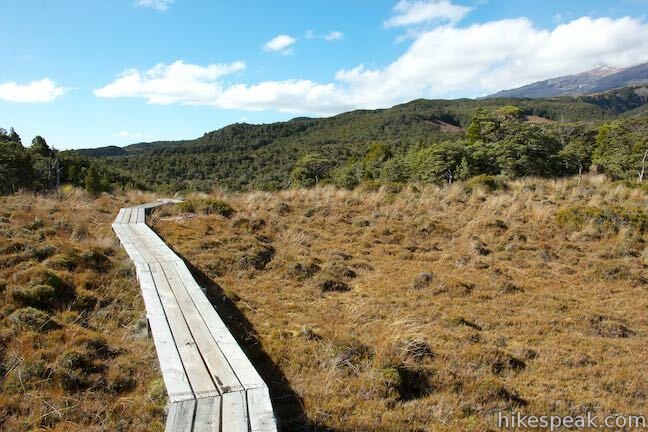 The boardwalk leaves the wetland and drops back into the forest where a dirt trail resumes. 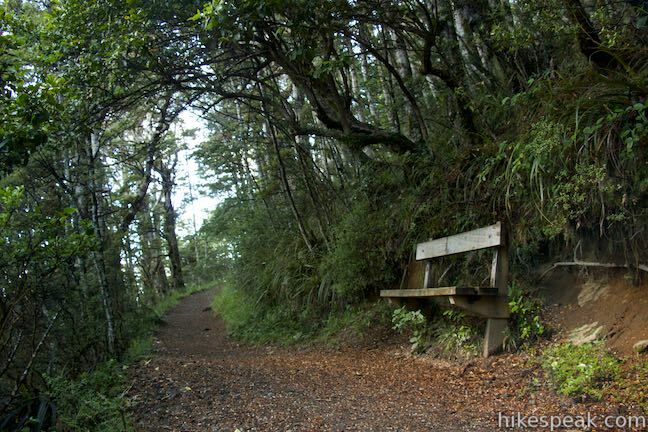 Head downhill on ridges covered in beech and cedars, passing another bench at 1.8 kilometers from the start. 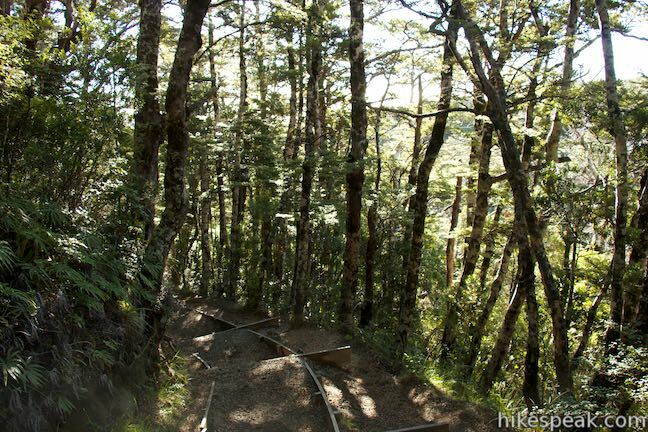 The track rolls out a few switchbacks as it drops into the canyon that contains Waitonga Falls. 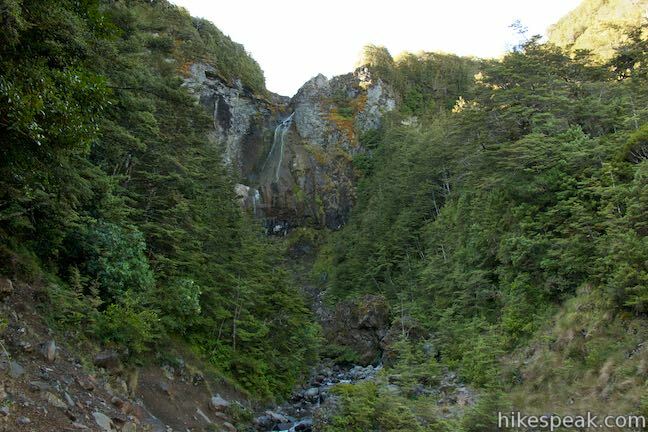 There is a sign for the waterfall just above the spot where a track crosses the creek to continue on to Blyth Hut. 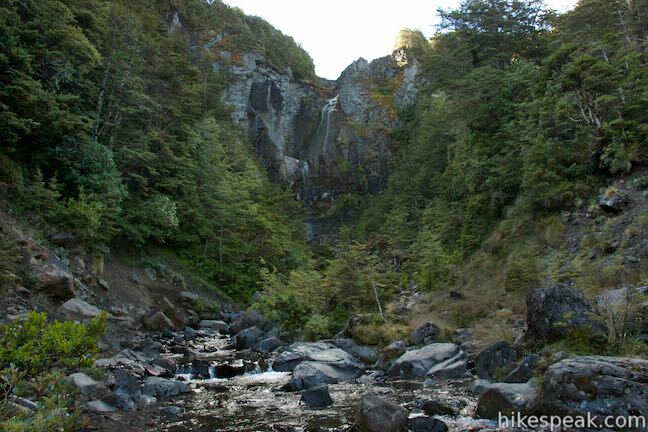 At this point, 1.9 kilometers from the start, you can look up the canyon for a view of Waitonga Falls. 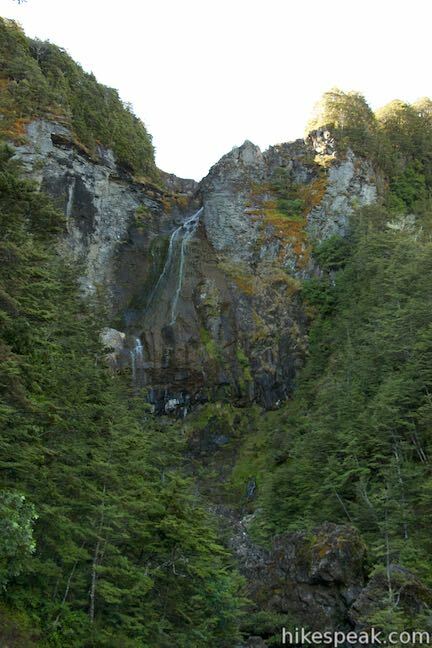 The two-tier waterfall makes a twisted drop off dark but colorful cliffs. 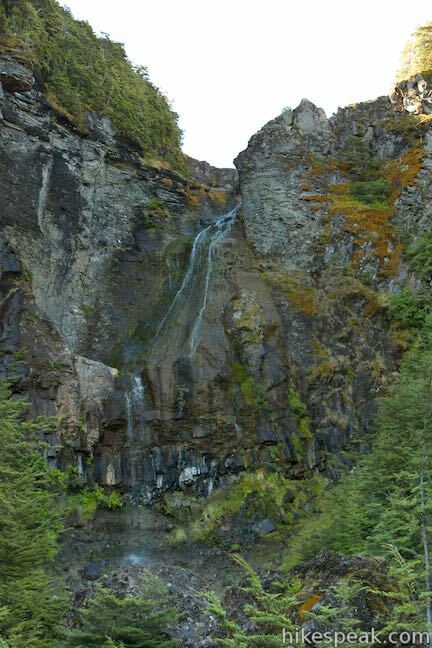 The top half of the falls is like a steep slide, plunging into a pool suspended on the canyon wall. 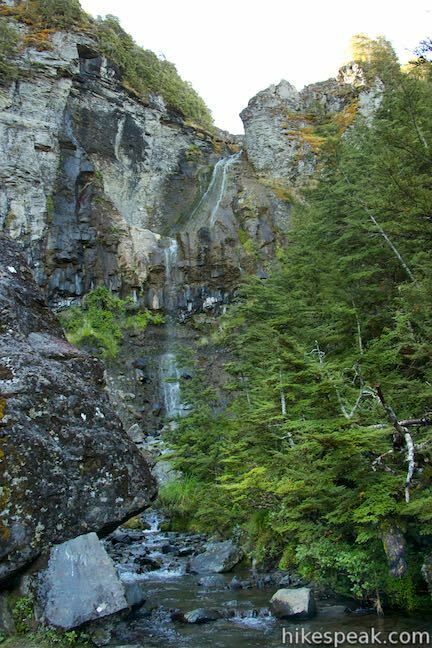 For there, the water leaps off the rock face and free falls to the base. 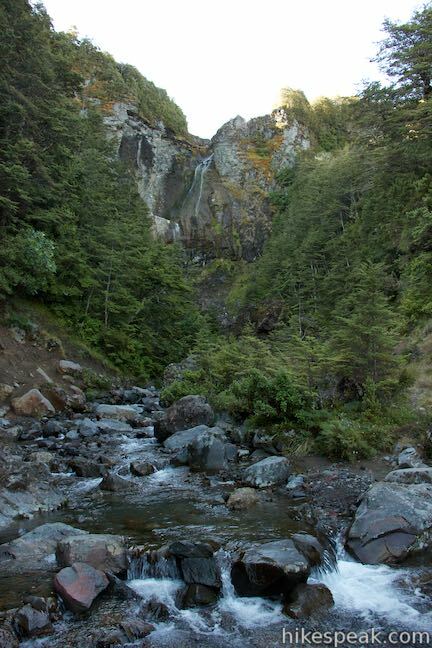 The bottom of the waterfall is hidden from view at the end of the track. 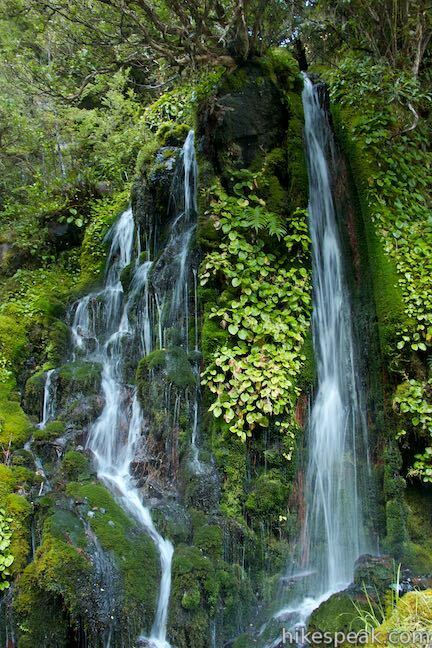 To reach it, you’ll have to rock hop and wade upstream. 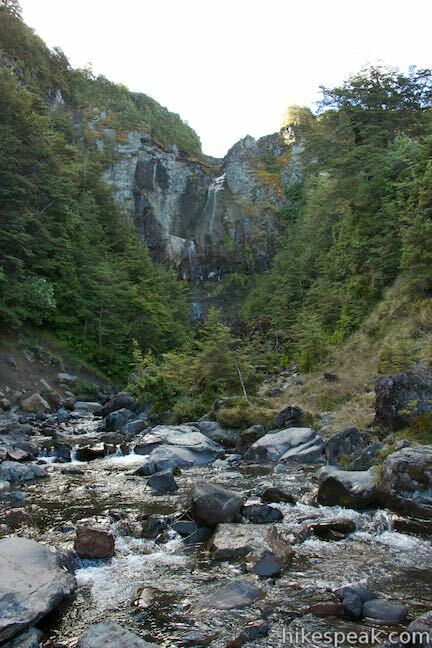 If you venture up the canyon, your feet may go numb in the frigid water (which drains from the snowfields on Mount Ruapehu), but you will be rewarded with closer views of Waitonga Falls. 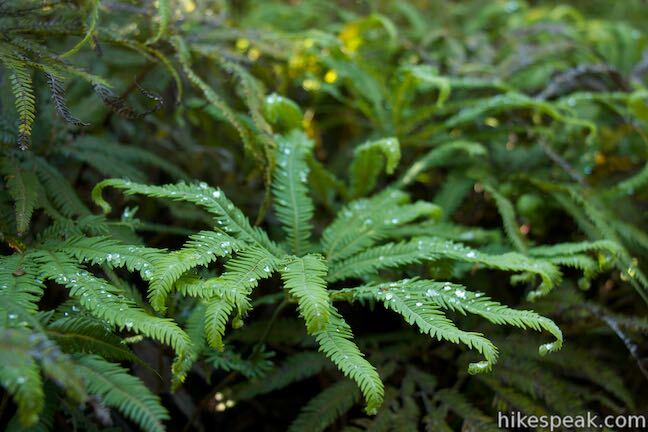 As you forge a rough course up the creek, look for mossy cascades pouring into the canyon on the left and right sides. 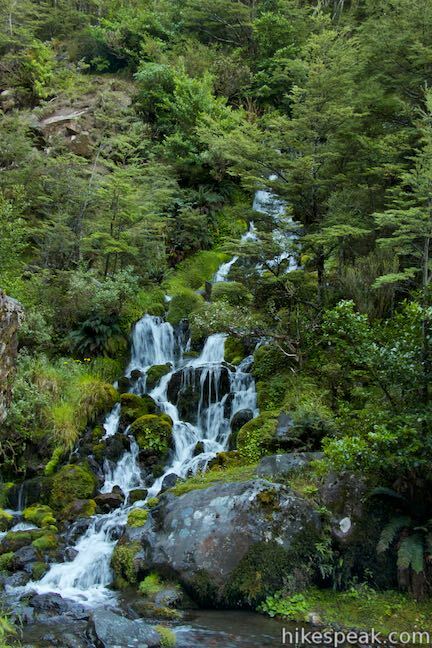 While small, these Little Waitonga Falls are quite lovely. 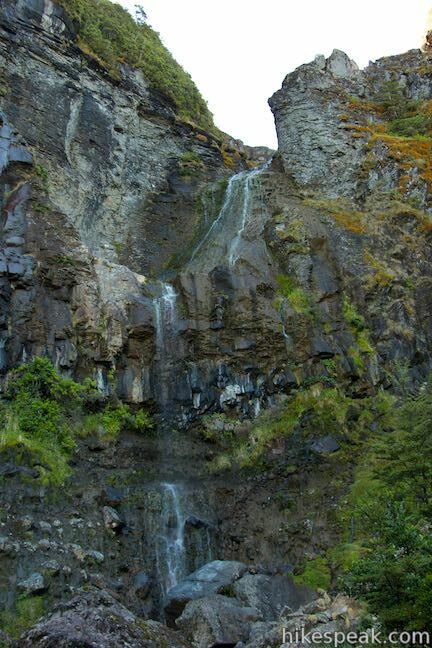 By ambling about 200 meters up the canyon, you’ll get a clear perspective of the bottom of Waitonga Falls. 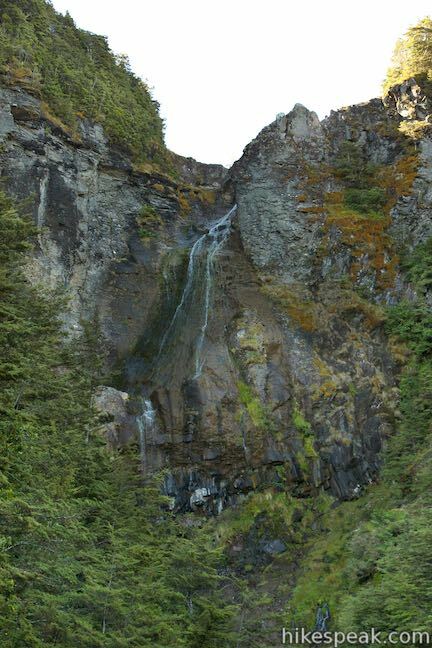 Unless the waterfall is engorged from recent rain or snow runoff, the lower tier will be made up of thin ribbons of water that fall delicately before colliding with the rocks below. 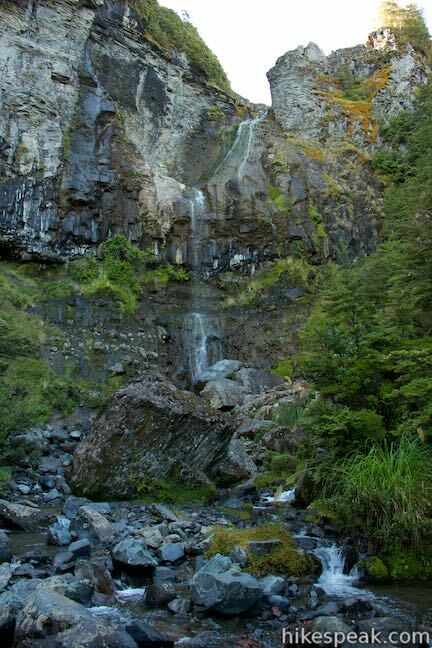 Waitonga Falls measures 39 meters (128 feet) from top to bottom, making it the tallest waterfall in Tongariro National Park. 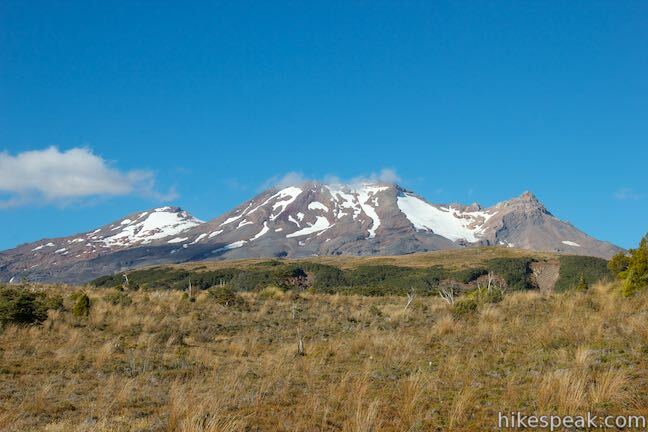 Unless you are continuing on to Blyth Hut or Round the Mountain Track, just return the way you came. 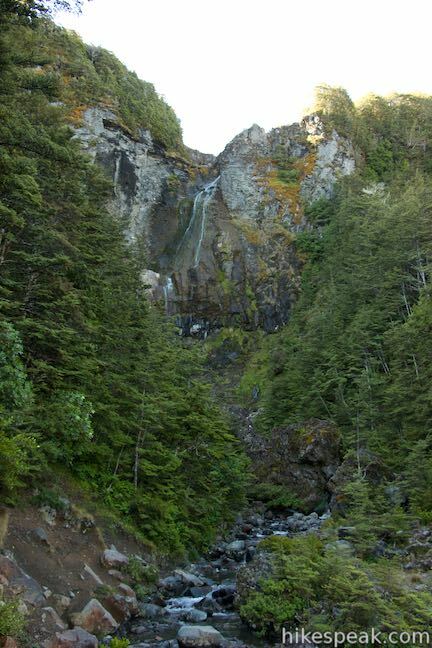 The hike is about 3.8 kilometers round trip if you stop at the point where the track crosses the stream below the falls. 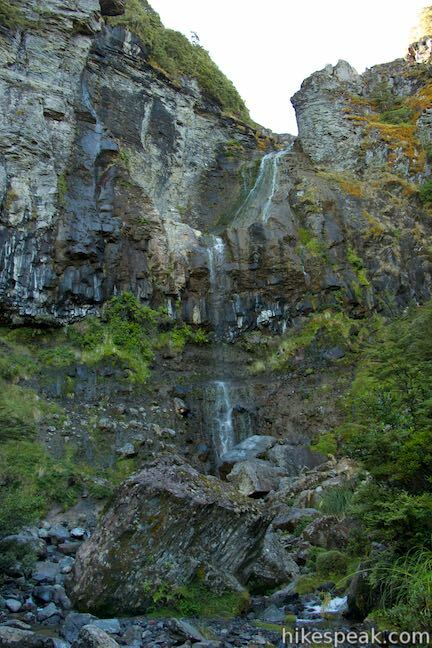 If you venture up the base of Waitonga Falls, the hike is about 4.2 kilometers round trip. Dogs and bikes are not allowed. 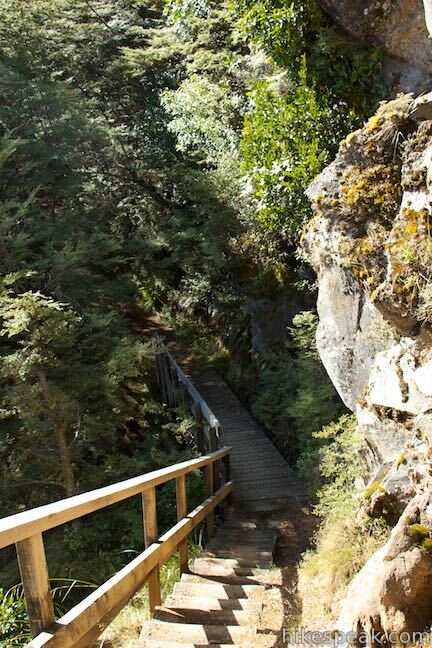 For a short hike to another nearby waterfall, check out Mangawhero Falls. 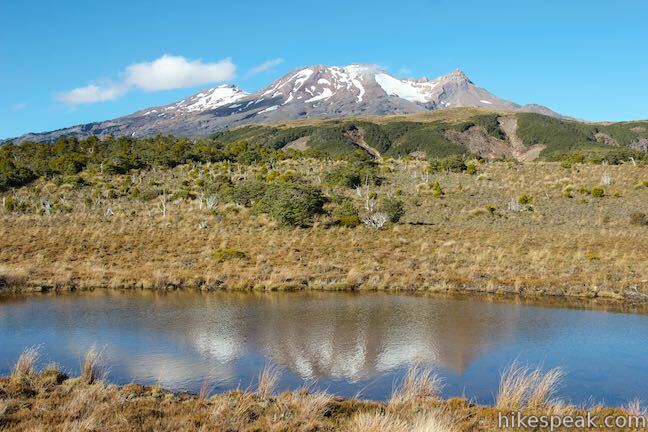 To compare reflections of Mount Ruapehu, take a walk to Lake Rotokura. 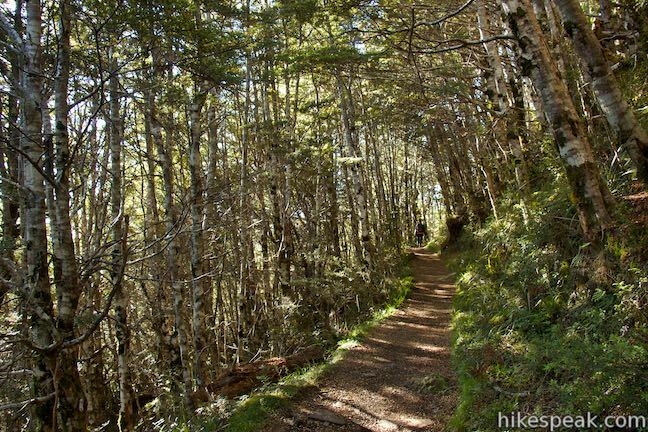 There is no entrance fee for Tongariro National Park and you do not need a permit to hike Waitonga Falls Track, so get out and enjoy! Directions: Take State Highway 49 to the center of Ohakune and turn north up Goldfinch Street, which is directly across from the i-SITE. 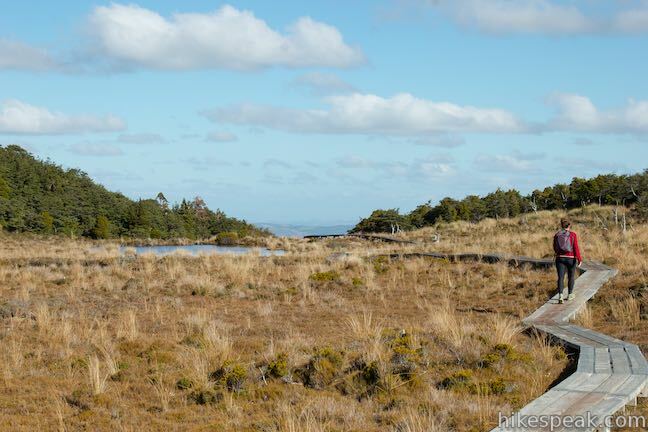 Drive 1.1 kilometers and continue onto Mangawhero Terrace. 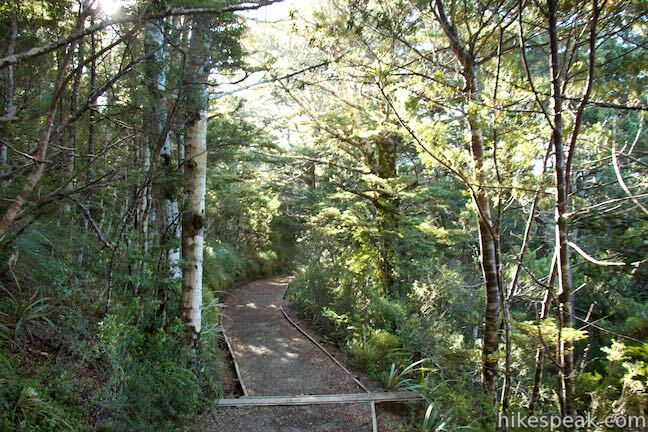 After 1.2 kilometers, cross Old Station Road, pass under railroad tracks, and continue north up Ohakune Mountain Road for 9.2 kilometers to Waitonga Falls Track, which begins from a turnout on the right side of the road. 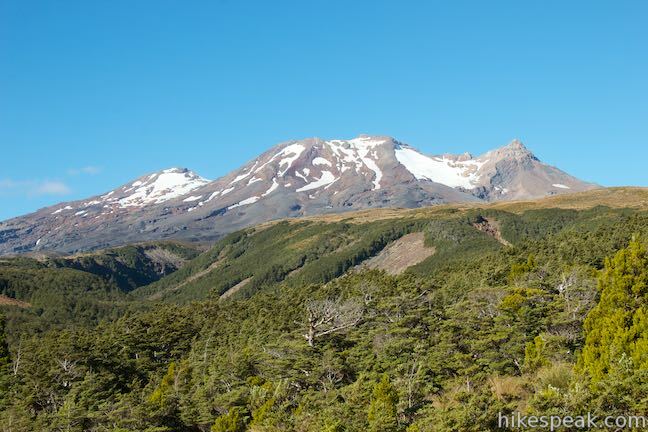 This easy 0.3-kilometer hike leads to a viewpoint for a 25-meter tall waterfall below Mount Ruapehu in Tongariro National Park. 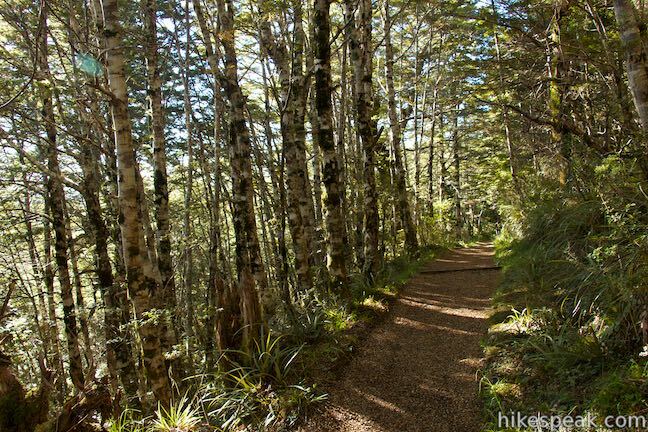 This short, level walk explores a Rimu forest along the Mangawhero River near the town of Ohakune at the south end of Tongariro National Park. 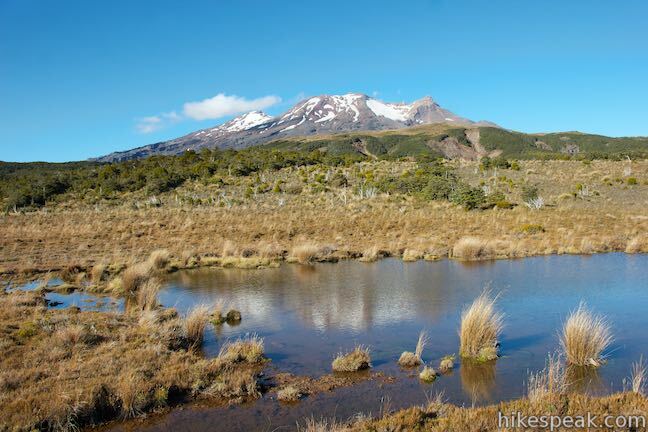 This 2-kilometer return hike reaches a peaceful blue lake that reflects a view of Mount Ruapehu, the tallest mountain in the North Island. 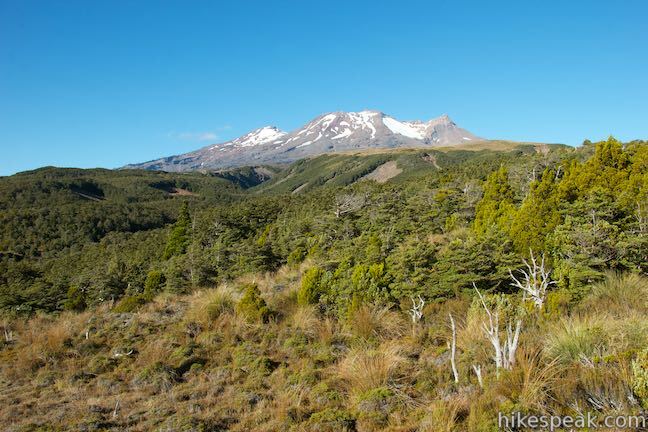 This 6.45-kilometer loop crosses a variety of volcano-influenced landscapes to reach a beautiful 20-meter tall waterfall in Tongariro National Park. 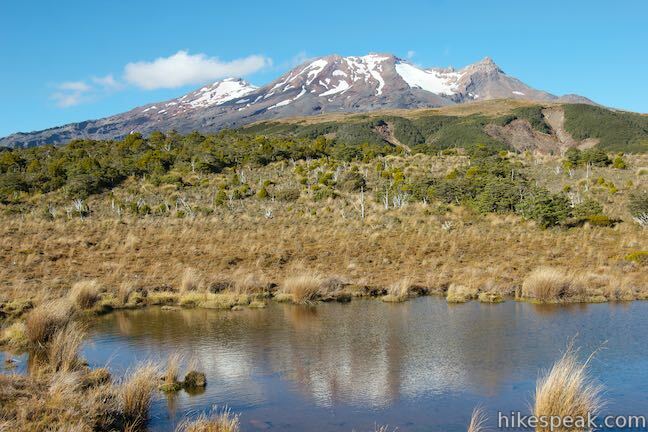 This 5.15-kilometer point-to-point hike or 7.15 kilometer loop leaves from Whakapapa Village in Tongariro National Park and crosses alpine bogs, forests, streams, and ridges of volcanic rock to reach creamy cascades on silica terraces. 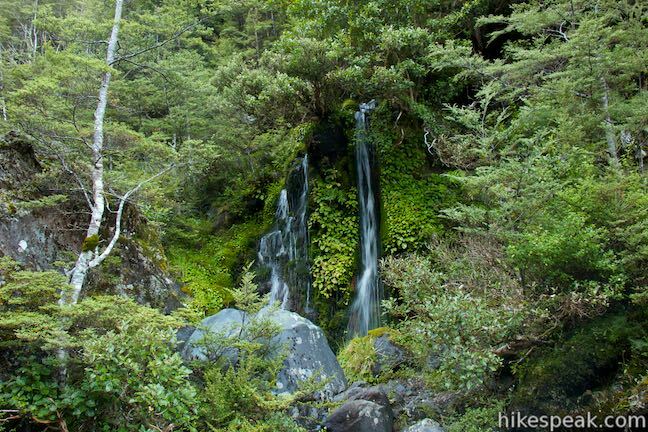 This 0.8-kilometer return hike visits a short but enticing single-drop waterfall near Whakapapa Village in Tongariro National Park. 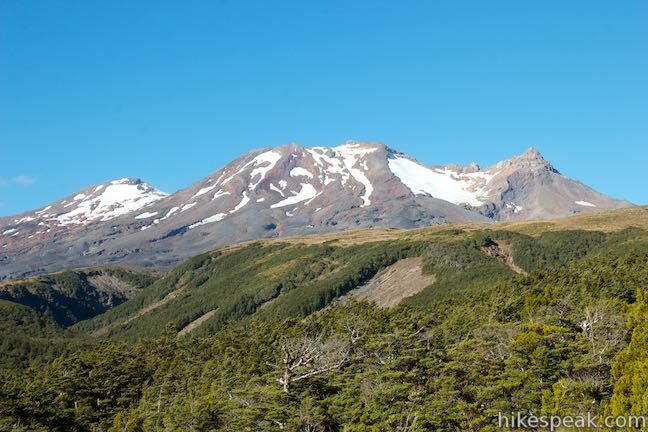 This 19.4-kilometer long through-hike ventures across dynamic volcanic landscapes in Tongariro National Park and ranks among the world's greatest day hikes. 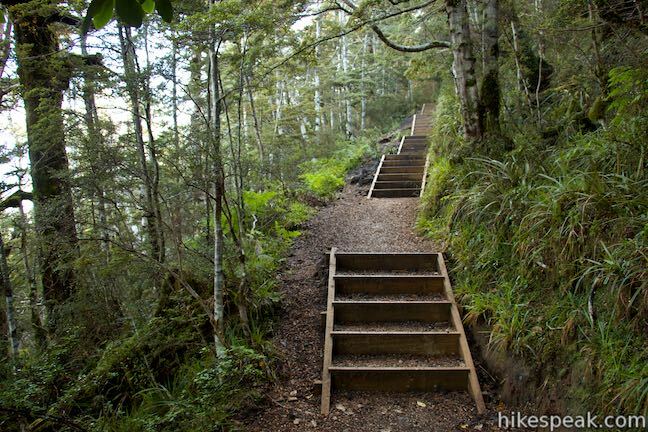 This 6.4-kilometer loop visits tranquil beaches on a forest-wrapped lake in Tongariro National Park. 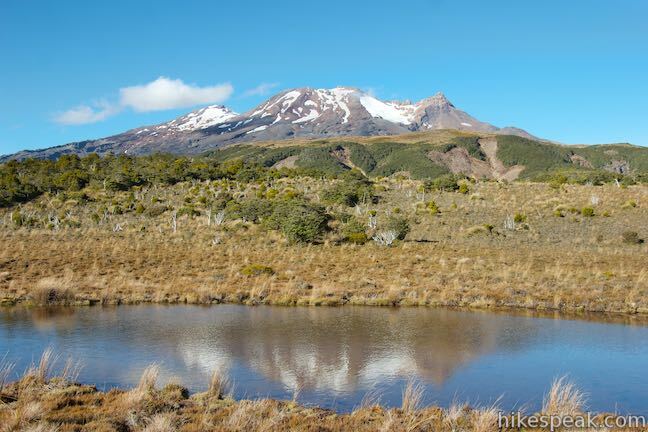 This campground in Tongariro National Park near Ohakuna, New Zealand has twelves sites on two loops with views of Mount Ruapehu. 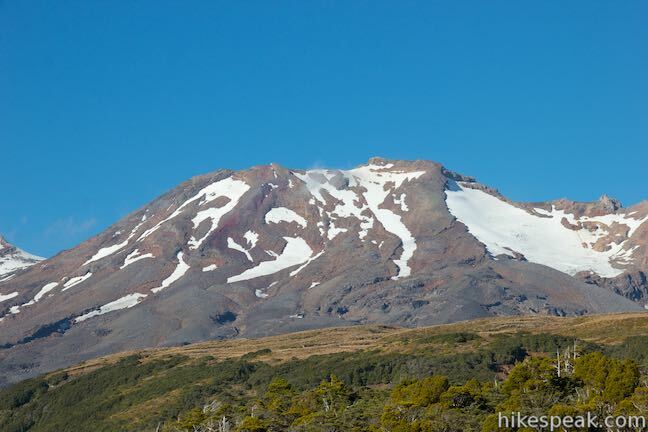 This holiday park in Whakapapa Village offers tent sites, campervan sites, cabins, and a backpackers lodge along a stream below Mount Ruapehu in Tongariro National Park.